Oliver Pearce graduated from MA Publishing at LCC in 2008. He has since gone on to become Global Marketing Director at ReneSola Ltd., a leading developer of green energy projects and supplier of energy-efficient technology products, in Shanghai. Oliver started his career as an editor at Noozz Media Group, an online Middle East-focused business information service, before moving to his wife Jiang’s hometown of Shanghai in 2009 to work as a copy-editor for the magazine Business Forum China. He then went on to work for various publications such as the 21st Century Business Herald, Interfax and the China Economic Review, before joining ReneSola originally as a Senior Marketing Content Manager in 2014. In 2012, Oliver contacted UAL keen to find out ways of bringing graduates in Shanghai together. With no group set up, Oliver began work building a supportive, inclusive and fun community in the city, inlisting the help of others to then form a committee to help manage activities. In 2014 the Shanghai Alumni Association was officially launched with Oliver as President. Oliver and his fellow committee members not only work to support Shanghai based alumni, but those across all of China by collaborating with other local groups. Back in 2012 you made your first enquiry with us about getting involved in a UAL alumni community in Shanghai. What made you want to do this? Both my wife Jiang Li and one of my best mates Jing Wu are both Shanghainese and from LCC, and I’m a West London boy born and bred. So there is this amazing bond between London, Shanghai and UAL that is integral to my life. 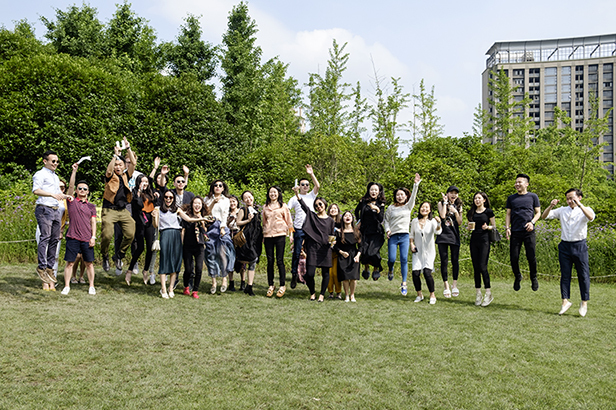 After we all moved to Shanghai, Jing and I met lots of UAL alumni who wanted to make friends with similar backgrounds, drink a pint, and who shared our passion for the UK and arts, so we decided to get involved with the Alumni Association. Our first ever event was a Christmas dinner with just 15 people, and it just grew from there. We now have over 500 members and have organized almost 30 events with partners including British Airways, the British Council and the UK Consul General. How is the UAL Shanghai Alumni Association now run? Committees can get political or top-heavy which delays the speed of progress, so we operate a four person Executive Committee that uses a simple majority vote to make decisions. Crucially we handpick all of our committee members from volunteers who have proved over a period of time that they are committed to doing the necessary work and who are aligned to our core values. President: Responsible for strategy, high-level networking and contact with the UAL alumni office in London. It also involves finding volunteers and pushing people to get things done. Creative VP: This person manages the visual side of our brand and is also responsible for building contacts with artists and designers and building creative partnerships and opportunities. Events & Partnership VP: Whoever occupies this seat must enjoy planning and executing events and finding commercial partners to support the group financially or through other means. Community VP: This role encompasses all marketing efforts, member database management and finding and recruiting new alumni not only in Shanghai but also in the UK. Fashion VP: As more than half of our alumni in this industry we recently decided to create this role to bring somebody aboard with strong fashion connections and who can really utilize the huge opportunities that we have available. We are currently looking for a candidate. Then we have a pool of 5-6 volunteers who provide support according to events or based on specific skill sets – set design, event MC, F&B, etc. The Committee organises a whole variety of events, what have been some of your highlights? We’ve had a lot of fun over the past five years, especially with the annual Christmas dinner which keeps growing and growing. Last year we did dinner for 160 guests at a hip dim sum restaurant (crackers included) on the historic Bund waterfront and invited guests from other UK art schools. An event I never thought I would ever organise was our Summer Ball in collaboration with Oxbridge, Imperial, LSE and UCL that was billed as a dating event. Around 40 girls and 20 boys got to know each other over afternoon tea and salsa lessons at one of the city’s top hotels. But we also focus on practical and creative issues. 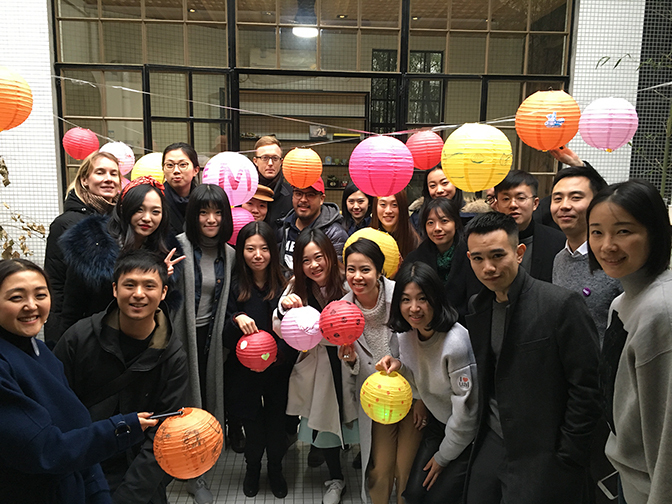 We have had career panels and events where alumni can bring out their playful side with painting and design and other arty activities, such as an event where we decorated paper lanterns for the Lantern Festival at the end of Chinese New Year. You have been instrumental in securing support from British Airways for all our Chinese Alumni Associations. Tell us more about this partnership and what’s planned. 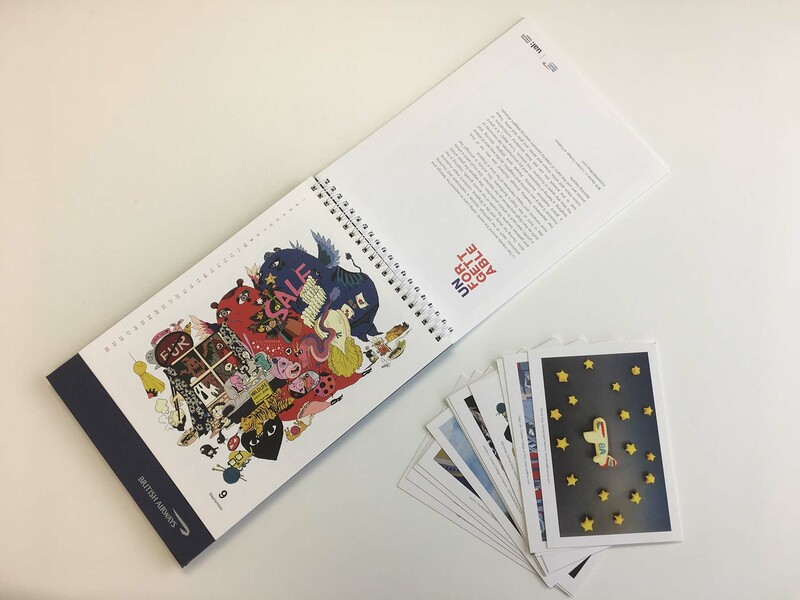 We held a design contest where 14 UAL alumni designed the 2017 marketing materials for British Airways in mainland China and Hong Kong – calendar, greetings cards, etc. – and the winners were rewarded with social media exposure and free flight tickets to London. The theme for submissions was Unforgettable – your memories of life in Europe and it was a huge success. This project is a great example of incredible collaboration among multiple stakeholders. British Airways did a similar project with the Korea Alumni Association in 2015 that was conceived by Sooyoung Cho, the former Association President (and who really helped us on our project). British Airways liked the work so much that they wanted to do something similar in China. 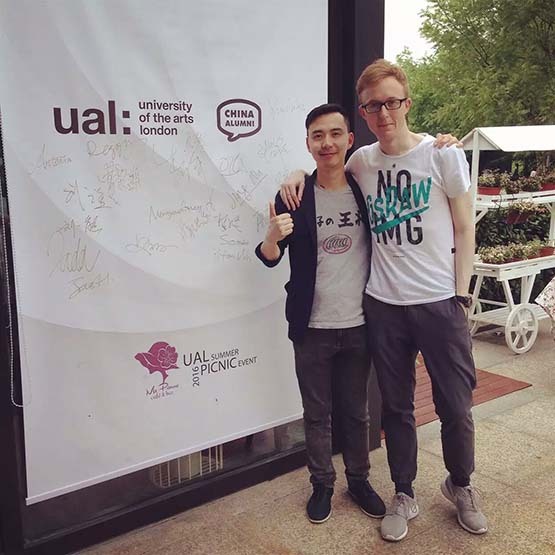 The Alumni office in London put us in touch with British Airways China and Joe Oliver – who founded the UAL Beijing Alumni Association in 2014. Joe built up the connections and trust with BA’s marketing manager to the point that they gave us a pretty free reign on the creative side of the project. Joe left China in mid-2016, so the UAL Shanghai Alumni Association took the lead in the coordination and design work with British Airways, working in tandem with the Alumni Associations in Beijing and South China to really make this a China-wide project. Recently you came back to UAL and hosted a very popular evening for our Chinese students or those wanting to know what it is like living and working in China. How did you find this experience? I was shocked at just how many connections have been made through the Alumni Association; we were able to invite creative professionals who live in China but were visiting London just as the career evening was planned to take place, Chinese alumni doing well in their careers in London, and many other China-related creative connections. I think seeing so many people hanging around for drinks afterwards and eagerly asking questions, engaging the speakers and building connections reinforced precisely why we built this alumni platform and highlighted its key strength. Why do you think alumni and, very importantly, you (!) enjoy being part of the UAL Shanghai Alumni Association? Because we are a family, and this is something we always emphasise. No matter if you are looking for a job, a vendor, a contact, friends, or even a husband, the Alumni Association is unrelenting in its focus on the needs of our members. We listen to what they want, and with a group this big with people at various stages of their lives and careers, their needs differ widely, and we cater accordingly. When we first formed, we dreamed big about high level events and exhibitions but it didn’t resonate with a community unaware of what alumni groups do. Therefore we scaled back our ideas and built this family from the ground up, getting bigger and stronger all the time. An alumni group that does not put its members first will never find relevance in our busy world. To keep growing out the platform that we have built in order to better serve our alumni family and their changing needs, to extend our partnerships with the other UK university alumni groups in Shanghai and also with the British Council, UK Consul General and British brands. The above includes practical issues like building a professional database and member management system so we have better data on who we have, which helps when dealing with partners and looking at commercial projects that we can take on to generate a regular source of income to finance our activities. We also want to build closer ties with the Chinese students in London and to get more non-Chinese alumni involved in our activities in Shanghai. We also wish to support the alumni office in London, which goes above and beyond to help our global UAL alumni groups; over five years you can see the tremendous progress they have made. I’d love to see the university recognise the value of alumni groups and allocate more resources to the alumni office – and therefore us – and I believe that the more success each alumni group achieves the closer we can get to making that a reality. Each of us has a part to play. Finally, we have come to the point where our work now extends far beyond Shanghai: we supported the creation of alumni groups in Beijing, South China and Hangzhou and this year we will launch the latest alumni association in Southwest China centred on the city of Chengdu, famous as the home of the Panda. The China alumni associations have adopted a motto “Creative Empire” and this is what drives all of us – there is no time to stop, we can rest in retirement. Find out more about the Alumni Association in Shanghai.